Searching for a professional keynote speaker or top inspirational speaker with expertise in a particular subject area? Use our quick-link list below for the world’s best motivational speakers, coaches and consultants. BigSpeak’s speakers bureau represents the most effective and popular business speakers, leadership speakers, women speakers, keynote speakers, innovation speakers, and motivational speakers for association and corporate conferences. Below, we have organized a helpful list separated by subject based on client’s specific requests. If you are interested in a custom list of proven speakers for your next conference, please contact us today. Don’t see a topic or category for the keynote speaker, motivational speaker or inspirational speaker you are looking for? Try our keynote speaker search box at the upper right of this page or the TOPICS link at the top of the page. Simply enter a keyword of the speaker you are looking for or use the Topic choice to search by our main topics, trending topics or all topics. 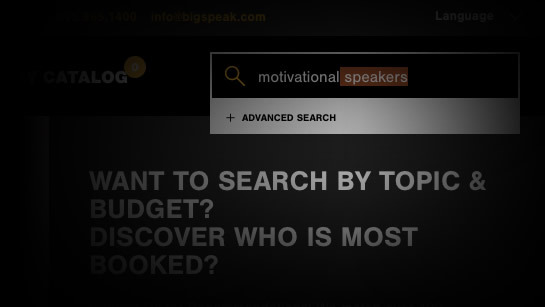 For any event you are working on, BigSpeak motivational speakers bureau will be of service to you to secure a professional and inspirational keynote speaker to make a BigImpact with your audience.